You are buying Enfamil Phenyl-Free 2Hp Non-GMO Diet Powder Vanilla 1lb Each, Model #4506481. ADW Diabetes offers a complete line of Enfamil baby formula products both in liquid and powder form. We offer these items in both single and discounted bulk quantities for your convenience.Trust ADW Diabetes for your Enfamil baby formula needs as we offer excellent pricing and superior service. The Enfamil Phenyl-Free 2Hp Non-GMO Diet Powder Vanilla 1lb is a high protein medical food powder that is free of the essential amino acid phenylalanine for children and adults with phenylketonuria (PKU). It provides all other essential amino acids as well as nonessential amino acids, carbohydrate, fat, essential fatty acids, vitamins, and minerals. Phenyl-Free 2 has less fat and fewer total calories than Phenyl-Free 1. 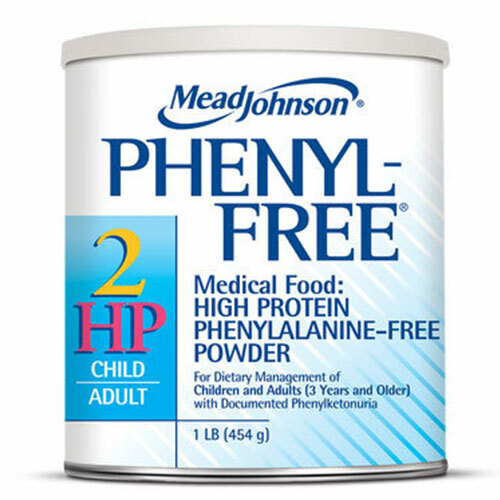 Phenyl-Free 2 HP is appropriate for women with maternal PKU or for children and adults who require fewer calories than provided by Phenyl-Free 2. 40 g protein equivalents/100 g powder.